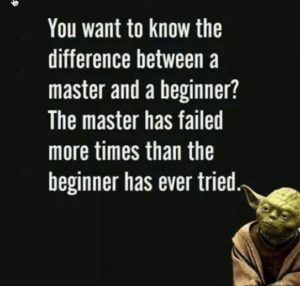 Ahhh, the wisdom of yoda!!! One of the greatest lessons we can teach our students is this- when we fail, we learn. My children (Beth and Hugh) hate to be wrong and they hate to fail. Bill and I have really been working with them over the last few years to understand that from our failures come our greatest learning opportunities. I am often reminded of Edison and his work with the light bulb. It took him failing 1,000 times before he got it right. In his words, he didn’t fail 1,000 times. It took 1,000 steps to figure it out. I often see children struggling the most with skills they don’t use that much in the classroom. Take for instance measuring. Measuring can be a difficult skill to master. One because it involves using a tool that is hard to understand unless you have continued practice with using a ruler. Think about this-when you use a ruler or measuring tape do you have to google those tiny little marks in between the larger marks? Do you remember how to discern the difference between the 1/4 and the 1/16th line? Come on now-admit it-some of you do!!! I do. Why? Because it is not a tool I use each and every day. Those who work in the construction business use it multiple times a day. Measure 3 times; cut once. Their brains are on autopilot. Ever heard of the phrase if you don’t use it you lose it? This week’s free lesson is a part of the lesson Measuring Plants and Animals. The lesson is really a tiered center activity that allows students to practice measuring. The group activity you are getting today involves students using inch worms (non-standard unit of measurement) to measure pictures of plants and animals. Students are given different pictures of plants and animals and ask to measure how wide, tall, and how long are the objects in the picture. The other center activity in the lesson plan calls for students to measure multiple attributes at one time (if you would like the entire lesson plan click here). We teach students to begin measuring with non-standard units of measurement because it gives them a visual representation of an estimate of how long something is. Sometimes we don’t need to be precise; we just need a quick estimate. For example, one inch (2.5 cm) is roughly the measurement from the top knuckle on your thumb to your thumb tip. The rule is this-parts of your body can be used to estimate many common units of measurement. Of course it is a good idea to first measure your own body parts in order to understand how close your own proportions are to these averages.For more information on how to use body parts to measure, check this out! I tell science teachers all the time, look for ways to incorporate measuring into the science curriculum. Don’t wait until the math unit to teach an reinforce this skill. Practice makes perfect!